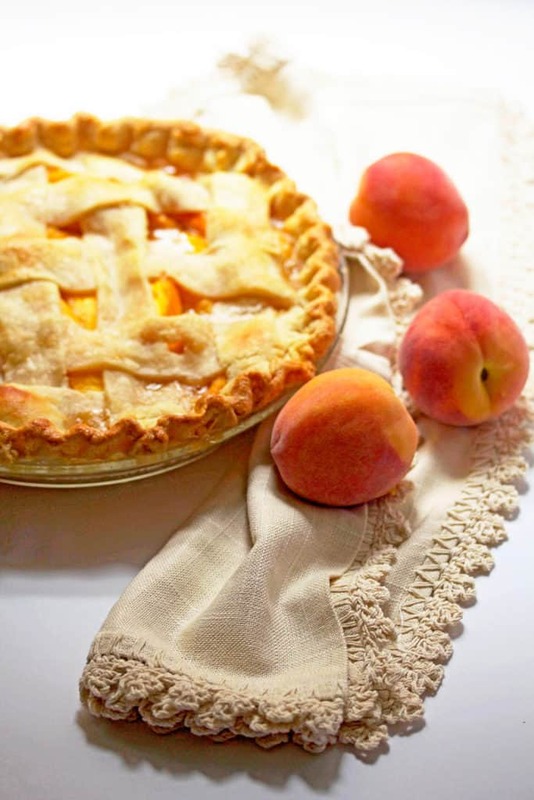 Homemade Fresh Peach Pie Recipe: There is nothing more comforting and delicious than this. 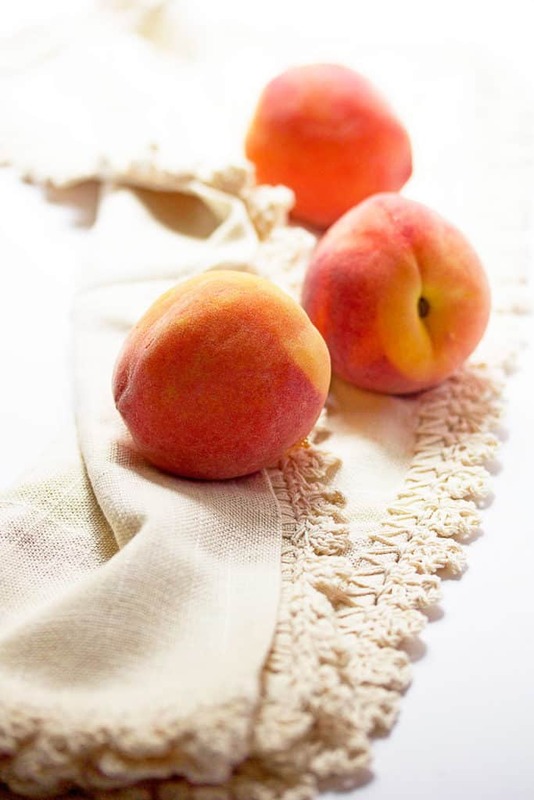 When peaches are in season, you need to reach for my recipe and treat yourself! Peach season is the most important season in my world. Countless cobblers, crisps, cakes and beautiful peach pie recipes are made in my kitchen during the summer, and I would not have it any other way. 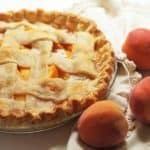 I understand that you would rather turn the oven off during the hot weather, but when you have luscious sweet peaches on deck, you have to do them justice, and this fresh peach pie recipe is the way to do so. I don’t share a lot of traditional pies on this blog. My family is more of a cobbler loving crew but we do make mean pies! My big mama makes such lovely fresh peach pies that this recipe is an ode to her. With fresh picked peaches and a flaky crust, she definitely set the bar high on what a true fresh peach pie should taste like. The filling of this pie tosses fresh peach slices with both brown and white sugars, lemon juice and zest, vanilla, and a bit of flour to thicken. It is sealed with my favorite pie crust recipe which I developed last year, and it is the only recipe I use. It has the perfect flaky texture (thanks to the hint of vinegar and cold ingredients) but ironically is also very tender (thanks to the egg yolk). It also has a great flavor (I use milk instead of water and sprinkles of salt and sugar). What you end up with is the best pie crust ever. After you add the peaches, dot with my favorite thing in the world, butter, you brush with an egg wash, sprinkle with sugar and bake this delight until golden brown and bubbly. There are no words for how fantastic this pie tastes. In fact, there is nothing more to say. On to this fab fresh peach pie recipe. There is nothing more comforting and delicious than my Homemade Fresh Peach Pie Recipe. When peaches are in season, you need to reach for my recipe and treat yourself! To a large bowl, add sifted all-purpose flour, salt and granulated sugar and whisk together to blend. Next, add diced butter and shortening to the dry mixture. Using a pastry cutter or fork, begin cutting butter and shortening into the flour creating various sizes of crumbs. The crumbs should range from course pea shapes to larger chunks. Add one egg yolk and vinegar to crumb mixture and stir around to combine. Finally, slowly pour in milk around the entire mixture in three intervals of ¼ cup, using your hands to begin bringing the dough together. After the last milk addition, shape the dough with your hands into a flatter ball disk. Wrap the ball in plastic wrap and place in the refrigerator for at least 1 hour (I like to refrigerate longer to make sure the dough stays cold during latticing or decorating the pie). In a large bowl, add peaches, lemon est and juice, both sugars, salt, nutmeg, cinnamon, and flour and toss together until peaches are well coated. Roll out half of the pie dough and place the rest in the refrigerator. Add rolled out pie dough to the bottom of your pie plate. Fill pie dough with peach filling. Dot top of peach filling with butter. Roll out remaining dough and add to the top of the peach filling in a full sheet, in a lattice design or in another decorative design of your choosing. Brush top of pie crush with egg wash and sprinkle with sugar. Bake for 35-45 minutes or until crust is golden brown and inside peach filling is bubbling. Peaches are quite simply my favorite fruit. This recipe is amazing and your photos have my mouth watering! Hands down, peach pie is my most favorite fruit pie. I just can’t stop at one slice. 🙂 Gorgeous pie! Same here Ashley! It is so addictive! That looks so good! I love good fresh peaches but haven’t found any yet. They should be coming around to you shortly! Can’t wait right? It’s totally a peach pie week! This looks gorgeous! I love your crust recipe, I am going to have to try it!! Thanks so much my dear! The crust is magical! Peach season is definitely the most important season! I love traditional pies so much. They are the best and this one is gorgeous! Same here! There is nothing better than a good classic peach pie. Beautiful photos! I want a big slice right now! Peaches are my favorite summer fruit. Nothing beats a fresh one – can’t even tell you how excited I am that peaches are finally in season. This pie looks incredible!! Gosh I seriously do a happy dance when peaches are in season!! I want this pie asap! Gorgeous photos as always. Question…we don’t always get the nice peaches up here in CT. Have you ever used canned or frozen? Hi Tina, I have used frozen that I have thawed out and it works just fine. Canned in a pinch will do too! Just drain them. Jocelyn, this pie looks absolutely beautiful. I love the traditional criss-cross pattern on the top! I just bought 2 peaches today from the supermarket. Extraordinary because it’s winter here in Australia, but I bought them because sometimes it feels like summer here anyway (it’s really not that cold). Then I saw that they were from the USA! Maybe they should be destined for something special like this pie, especially as they were so expensive! Oh gosh! I bet it is hard to get some nice peaches right now in Australia. Oh yeah! I think she would like this one too. Grandmothers are pie masters! Your peach pie makes me fall in love with peaches even more! <3 LOVEEEEE this! Thank you so much Samina! If you didn’t love peaches before, you will love them after this! The crust is seriously the best crust ever! It makes me happy every single time I taste it! Does the vinegar create an after taste? How delicious! I love peach season too, in fact, I just whipped up some cobbler today! Oh man I bet that cobbler was oh so good! Ok so this totally got me in a HUGE pie mood. I’ve been eating peaches pretty much every day for lunch. I need this in my life right now! Oh yeah this recipe is perfect for all of those peaches you are eating on a daily basis! This is seriously just so beautiful, Jocelyn! It’s almost too beautiful to eat! … almost … You certainly highlighted peach in the best way ever. Love it, girl. I agree! I stared at it for an hour and then decided to dive in! Best decision ever! Thank you so much Dana! It is one of my favorites too! This looks like the most perfect peach pie I have ever seen, love it! Hooray!!! Thanks so much Matt!! Peach pie is my mom’s favorite! I may have to try yours for her birthday in a couple of weeks! Your mom sounds like a very lucky lady indeed! Aww thanks so much girl! I love a girl that loves peaches! best lookin’ peach pie around. This is a beautiful pie, Jocelyn – I love love love peach pie! Thank you so much Sally! You are a girl after my own heart! This is one sensational-looking pie! Hooray thanks so much! Kelly I imagine that your berry pies are absolutely delicious!! Now I want to see a berry peach pie from you! Peach pie just screams…SUMMER! How beautiful! Aww thanks so much Tonia! love everything about this pie .. especially the beautiful lattice top! Peach pie is one of my faves!!! This is summer right here! This is totally summer girl! Every time I eat this pie, I feel summer. Wow! I’m not a big fan of peach pies but this looks like heaven!!!! Pinned! Hooray thanks so much Julie!! 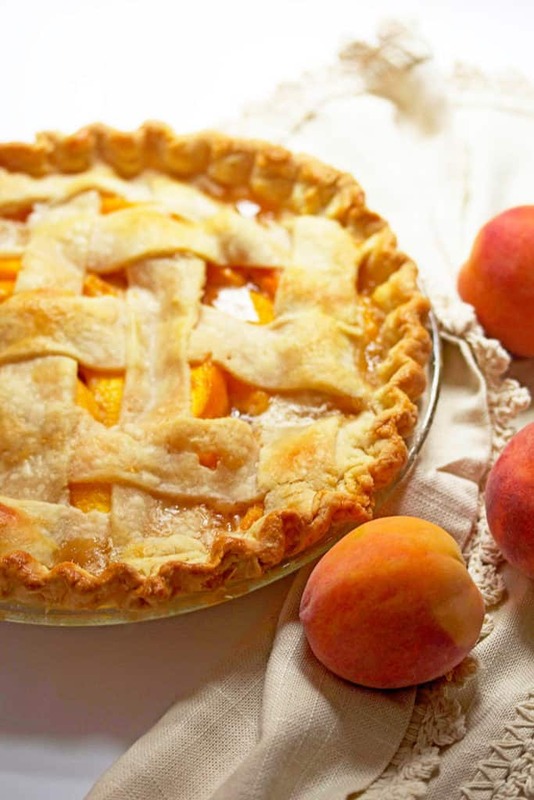 Fresh peaches are THE best right now and this pie looks wonderful! I usually make at least one pie each summer, and haven’t yet this year. Maybe this will be the one! It is definitely time for you to get in that kitchen and get a pie made asap Kristine! Hooray! I am grateful. This pie crust is seriously my fave ever! Thank you so much Renee! I totally know the feeling of the peach addiction!